Nigeria’s U-19 Cricket Team, the Junior Yellow Greens, have beaten Tanzania by 35 runs to advance into Division One and booked a place in the African qualifiers for the 2020 Cricket World Cup in South Africa. 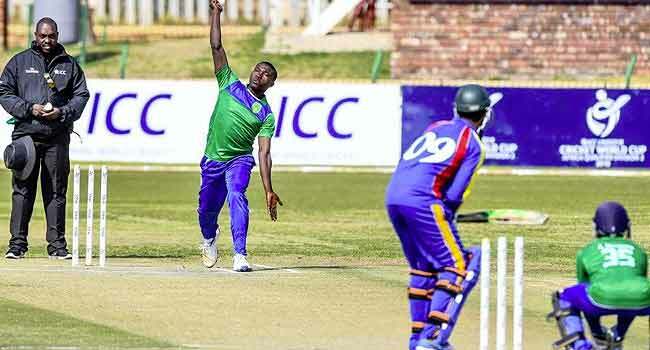 In the keenly contested first semi-final match on Sunday, the Nigerian team showed class over their opponent to maintain their unbeaten run at the ICC Division Two qualifiers in Potchefstroom, Senwes Park in South Africa. Tanzania won the toss and elected to bat, taking early wickets in the innings to put the Nigeria batting side under intense pressure in the 50 overs match. The last two partnership of the Nigerian batters, Ifeanyi Uboh and Segun Ogundipe boosted their runs by 80 runs to push Nigeria’s total runs in the first innings to 169 runs (all out) in 46.2 overs. In the second innings, Tanzania looked determined targeting 170 runs to win but were overwhelmed by the persistence of the Yellow Greens bowling and fielding who stopped them at 134 runs (all out) in 43.2 overs. Gokul Das of Tanzania boosted the runs for his team scoring 61 runs off 104 balls with a strike rate of 58.65 before being caught by Nigeria’s Mohameed Taiwo. Nigeria’s Peter Aho was on top of his bowling taking four wickets after bowling his allotted 10 overs conceding 37 runs. Also, Nigeria’s spinning duo, Sylvester Okpe and Isaac Danladi did the clean-up to limit the runs of the Tanzanians while taking wickets to seal Nigeria’s victory. Okpe (who is also the captain of the team) took two wickets after bowling 10 overs and conceding 20 runs while Danladi took three wickets after bowling the last wicket in his total 4.2 overs, conceding just eight runs. Nigeria’s Segun Ogundipe scored 62 runs off 68 balls with a strike rate of 91.17 to score the highest runs for his team and clinched the Player of The Match award. Nigeria will play Sierra Leone in the final on Tuesday to determine who will emerge champion.